Folliculitis - A term many Australians are familiar with but why? Why do we get Inflamed or Irritated hair follicles? Folliculitis literally means “inflammation of the hair follicles” and is usually caused by infection or irritation from hair removal. It’s often assumed that folliculitis equates to an infection. When infected, Staphylococcus bacteria is the usual cause. This bacteria is carried by many of us on the skin and at the front of the nose. Folliculitis is most often caused by physical irritation to hair-bearing skin. Think of shaving, waxing and other methods of hair removal. Folliculitis may be recurrent, severe and distressing. At the other end of the scale, many people have mild folliculitis that may be picked up for the first time by a skin cancer doctor. Most people with folliculitis do not have underlying medical problems although it may be associated with Type 2 diabetes, obesity, immunosuppression, and chronic antibiotic use. 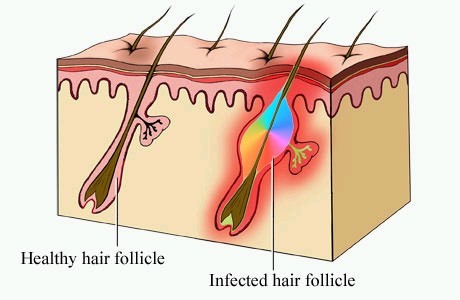 Superficial folliculitis – affecting the upper part of the hair nearest the surface. This type of folliculitis may be itchy. Deep folliculitis – affecting the whole depth of hair, causing larger lesions that may be painful. A boil is a type of deep hair follicle infection. Let’s start by looking at folliculitis on hair-bearing areas. 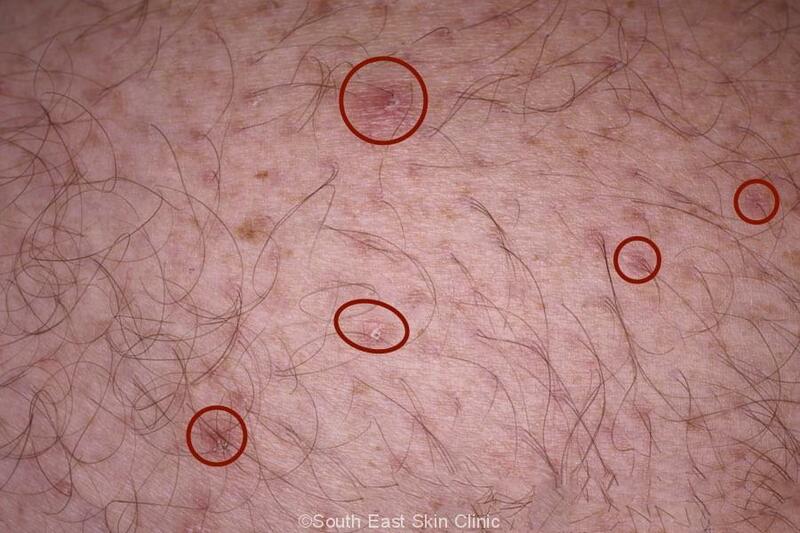 Compared to areas of skin without obvious hair, this is both more common and an easier diagnosis to make. 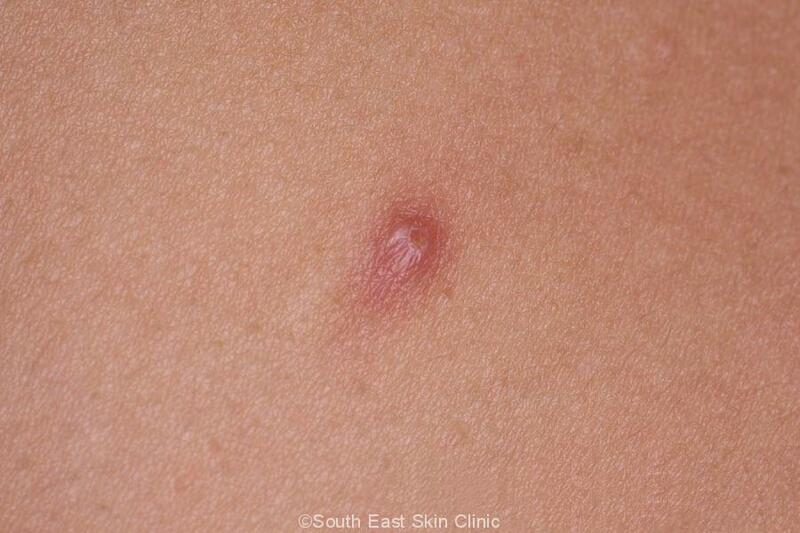 Look for multiple bumps each centred on a hair follicle. The bumps contain inflamed material. 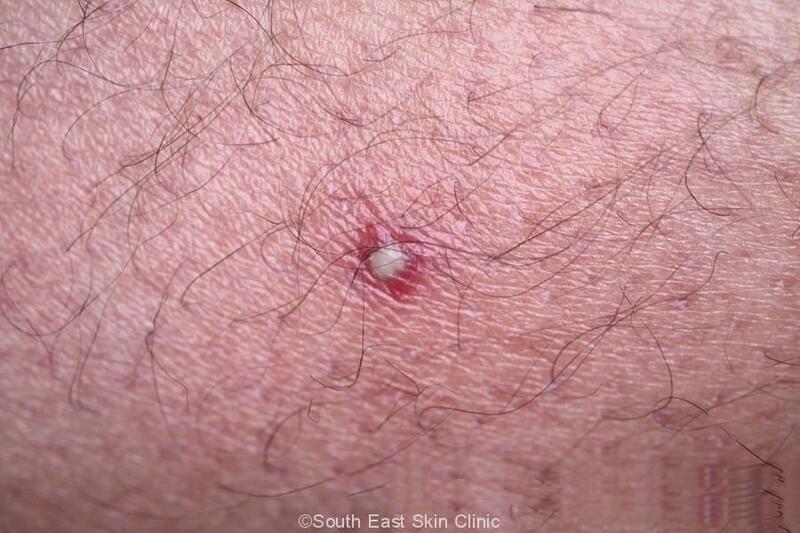 When infected, you’ll see whitish material leading to the name “pustules.” You may see a hair come from the middle of the bump. 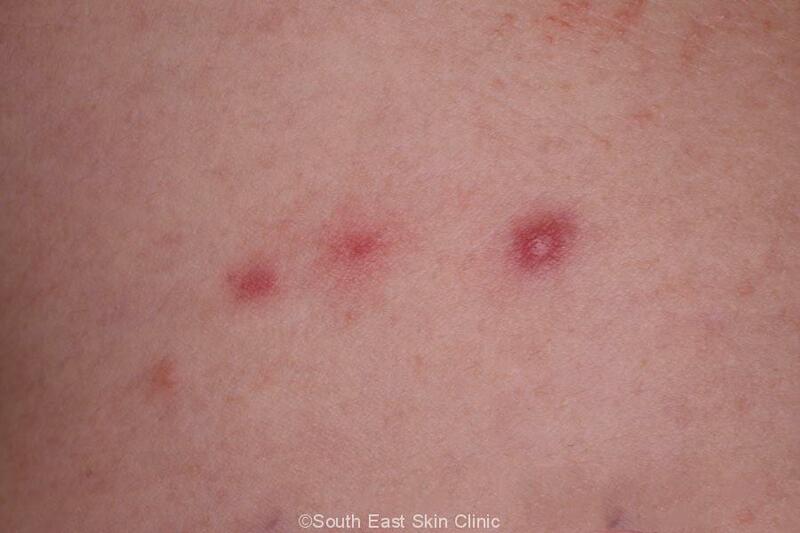 Multiple pustules each centered on a hair follicle is very typical of bacterial folliculitis. In non-hairy areas it may be harder to know if you’re looking at an inflamed hair follicle, or something else like an insect bite. The deeper the inflammation, the more pronounced the appearance – as you’d expect. 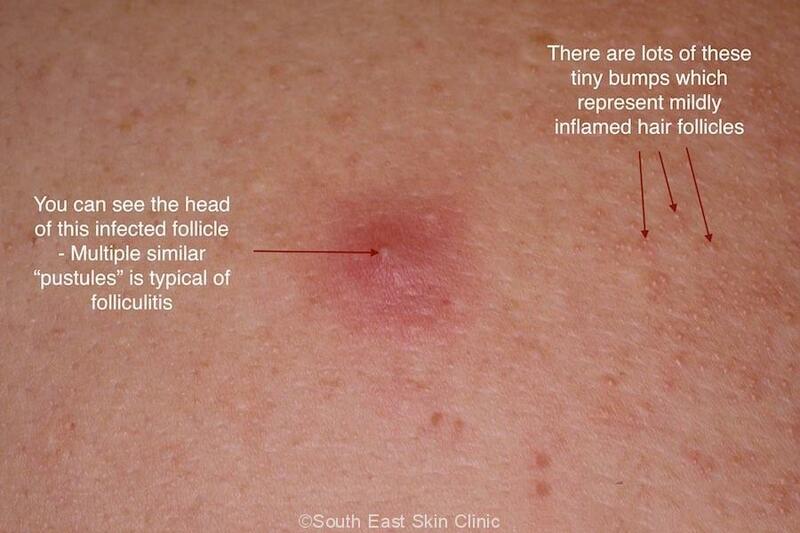 A boil is the deepest type of folliculitis whilst superficial folliculitis may appear very subtle as you can see in the photos. Under the arms or in the groin. These hair-bearing areas are are subject to friction, heat and/or sweat. Legs that have been shaved (so-called pseudofolliculitis). Folliculitis may also be caused by trauma of hair follicles by waxing or hair-removal creams. Legs that have been covered in cream or ointment that may block the hair follicles. Trunk and/or buttocks – these are commonly non-infectious in younger to middle aged people. May be triggered by wearing occlusive clothes or working in a warm environment. Severe Scalp folliculitis may be caused by folliculitis decalvans. What other infectious types of folliculitis are there? Malazezzia is a yeast and this causes Malazezzia folliculitis in young adults. Usually occurs on the upper trunk and shoulders. Common in Australia because of the humid environment. Pseudomonas is the cause of “hot tub folliculitis” and causes folliculitis in skin folds or under bathing suits. “Gram-negative folliculitis” may occur after long term use of antibiotics for acne and normally occurs on the face. There are other rare types of folliculitis. Superficial infected folliculitis may be treated with antibiotic cream whilst deep folliculitis is usually treated with oral antibiotics. What can I do about recurrent infectious folliculitis? Topical antibacterial to the inside of the nostrils, for example with fucidic acid or 2% mupirocin, along with antiseptic application to the rest of the body. You can buy chlorhexidine or potassium permanganate washes directly from the pharmacy. Oral antibiotics may be considered. If you or a doctor looks closely at your skin, the chances are there will be at least one inflamed hair follicle! Scurvy can look very much like folliculitis – and it happens in Australia. Widespread folliculitis can present with bald patches in dogs. Folliculitis is frequently misidentified as pimples or boils.